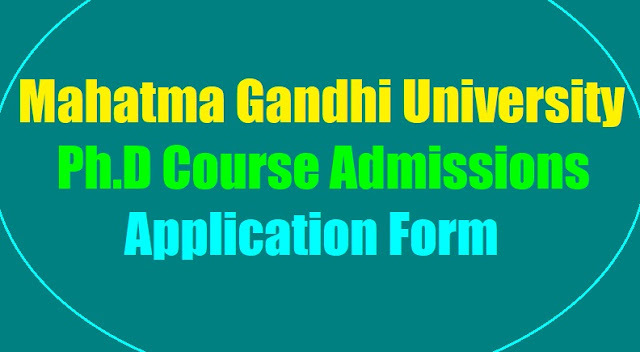 Mahatma Gandhi University Ph.D Course Admissions 2019, Last date to apply 30-04-2019: Mahatma Gandhi University Ph.D Course Admissions 2019-2020, MG University Ph.D Admissions 2019, Mahatma Gandhi University Ph.D application form. Ph.D programme Admissions in Faculty of Commerce & Management, Faculty of Social Science and Faculty of Science. Mahatma Gandhi University invites applications from the NET / SET/ SLET/ M.Phil (regular mode) candidates for admission into Ph.D programme in the following subjects during the academic year 2019-2020. 1. Challan for Rs.500/- towards registration fee, drawn in favour of the Director of Admissions, Mahatma Gandhi University. 1. Incomplete applications without the requisite enclosures are liable to be rejected. Applications may be downloaded from the University website www.mguniversity.ac.in and filled in applications along with the enclosures and a Challan for Rs 500/- drawn infavour of the Director of Admissions, Mahatma Gandhi University, payable at Nalgonda has to be submitted to the Director, Admissions on or before 30th December, 2019 before 4:00 PM. No Application will be entertained after last date.